A simple urine test could save lives from prostate cancer, according to new research supported by the Irish Cancer Society. Cancer researchers at University College Dublin (UCD) have led the development of a new test which uses urine to pick up prostate cancer. Studies have so far shown the test to be 70pc more specific for prostate cancer compared with the blood test currently used by doctors. If the new 'epiCaPture' test is further validated it could help to more accurately identify which men do or do not need invasive tests. This means that many men could be spared harsh treatments that often have long-term side-effects. The test could also help to identify aggressive prostate cancer early, so that more patients can be potentially cured of their cancer. "This major new research highlights the vital work world-class cancer researchers are doing in UCD and across Ireland to identify new ways to improve the diagnosis of cancer. More work is needed before the potential benefits reach cancer patients. But it does show the potential we have to save more lives from this disease," said Dr Robert O'Connor, head of cancer research at the society. In Ireland, 3,500 men are diagnosed with prostate cancer annually. One in three of these cases will be aggressive cancers, and around 500 men die from the disease here every year. This research was part of an international collaboration led by Dr Antoinette Perry, assistant professor of cell biology and genetics at the UCD School of Biology and Environmental Science and the UCD Conway Institute, and her team, including PhD student Eve O'Reilly and Irish Cancer Society-funded researcher Alexandra Tuzova. "Prostate cancer is the fourth leading cause of cancer deaths in Ireland so early detection is vital to catch the disease before it spreads. "Unfortunately, the tests we have to detect prostate cancer are not entirely accurate," Dr Perry said. 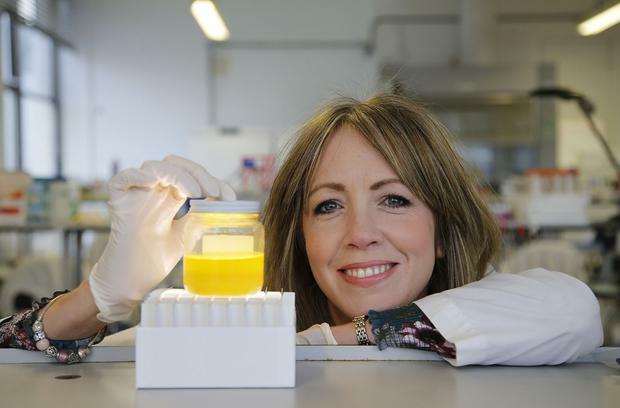 She said their research, funded with the support of the Irish Cancer Society and others, is addressing this problem by developing new ways to catch aggressive, potentially lethal prostate cancer from a simple urine test. "Over the last four years our research team at University College Dublin has worked with doctors, nurses, patients and other scientists from around Ireland, the UK, USA and Canada to study urine from almost 500 men. "We showed that almost 90pc of men with aggressive prostate cancer have changes in their DNA that we could find in their urine. These changes were absent in healthy men and men with non-aggressive disease. "If we can replicate these findings, our research could contribute to a new, more accurate test to help catch aggressive prostate cancer and save lives from this disease." The epiCaPture technology developed by Dr Perry is at the advanced stages of a patent application. Funding for this research was supported through donations from the public to the charity. Details about the project were released in advance of Daffodil Day, the society's major annual fundraiser, which takes place this Friday. It will bring out volunteers in force all around the country.